In this article, we are going to learn the difference between StringBuffer and StringBuilder in java. 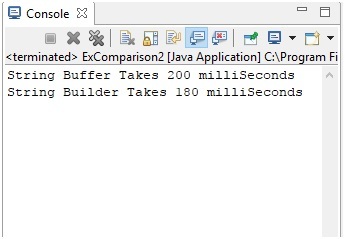 StringBuffer and StringBuilder are two classes of java, which are used for string. These are used whenever there is a need of a lot of modification to Strings. StringBuffer and StringBuilder objects can be modified again and again. The only difference between StringBuffer and String Builder is that, StringBuilder methods are not synchronized that is they is not thread safe as two threads can call the StringBuilder methods simultaneously. On the other hand String Buffer is thread safe. It’s better to use StringBuilder as it’s much faster than String Buffer. Let’s take an example to check which one is faster. //append method of string buffer add the data in string object. //(et-st) shows the time taken by the String buffer. ////(et-st) shows the time taken by the String builder. As you can see StringBuilder takes less time than StringBuffer.